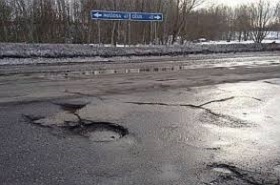 This winter, 296 kilometers of state highways, 1,440 kilometers of regional roads and 3,764 kilometers of local roads are in critical condition, representatives of Latvijas Valsts Celi (LVC) state-owned road maintenance company told LETA. LVC representatives also warned that potholes can appear in some sections of state highways that are in poor conditions and affected by changeable weather conditions and fluctuating air temperatures. The road maintenance company also informed that during winter thaws and between seasons only the most dangerous potholes are being patched on state highways. When the air temperature is at around zero degrees, cold asphalt is being used to repair the potholes and cracks in the pavement. These urgent road maintenance works are being carried out in order to prevent accidents and ensure safe traffic until weather conditions permit to start more substantial repairs with hot asphalt, the LVC representatives said.